Nick is one of the three hosts of Michael Waddell’s Bone Collector that airs exclusively on the Outdoor Channel and his comedic, charismatic character is true and real. Nick has had the opportunity to travel and hunt in over 15 states, 3 different continents and spent opening day of the 2017 bowhunting season with Hurley and Lost Mountain Outfitters right here in Kentucky! What a beautiful buck! For the ultimate hunting experience, information or questions, contact Hurley Combs at 606-271-1037. T-Bone Outdoors with Travis Turner went after this beautiful Kentucky buck and connected. Congrats to him and to Kurtis! 2017 Muzzleloader success !!!! "Punched our tag on a Eastern Kentucky Hills and Hollers Whitetail. Big thanks to Hurley Combs and his family"
​For the ultimate hunting experience, information or questions, contact Hurley Combs at 606-271-1037. 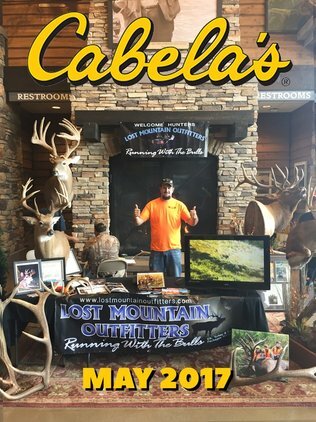 Welcome to Lost Mountain Outfitters, Kentucky's premiere elk, deer and turkey hunting outfitter. LMO is located on the fringe of the majestic Appalachian Mountains in Eastern Kentucky and smack dab in the heart of the elk restoration zone which covers 16 counties in the southeast region of the state (approximately 4.1 million acres). The Kentucky Fish and Wildlife Department estimates our elk population is approximately 10,000 animals making Kentucky the highest elk population of any state east of the Mississippi River. The state's first elk hunt was conducted in 2001. The population growth is well ahead of the original model and expected to steadily increase with thousands of acres of mountainous terrain and reclaimed strip mines providing prime habitat for elk. Our big buck hunting is second to none in the foothills of the Appalachians. Success of Kentucky deer hunters is nothing short of astounding. Almost yearly, deer hunters are rewriting the record books in one form or another and Eastern Turkeys have posted some great harvests in recent years in our corner of The Commonwealth. Your Hunt at Lost Mountain Outfitters will include everything from the first "welcome to camp" handshake ... to the trip ... to the taxidermist. LMO furnishes meals, drinks, lodging and transportation to and from the field. When you harvest your game: 1) we field dress 2) transport to camp 3) transport to butcher 4) and TRANSPORT YOUR TROPHY TO THE TAXIDERMIST! Simply the ultimate Kentucky hunting experience. 2017 Elk Season was a Huge Success! ​The pictures are still rolling in! 2017 Deer Season was Awesome! Hurley going toe-to-toe with a big bull in this video! Where dream hunts become reality. Kentucky's first ever harvested 400" gross bull and new state record elk. Guided by Hurley Combs of Lost Mountain Outfitters.